In this luminous and spirited debut, Margaret Wrinkle takes us on an unforgettable journey across continents and through time, from the burgeoning American South to West Africa and deep into the ancestral stories that reside in the soul. Wash introduces a remarkable new voice in American literature. Along the Tennessee frontier in the early 1800s, two men find themselves locked in an intimate power struggle. Richardson, a troubled Revolutionary War veteran, has spent his life fighting not only for his country but also for wealth and status. But when the pressures of westward expansion and debt threaten to destroy everything he’s built, he embarks on an audacious plan. He sets Washington, a young man he owns, to work as his breeding sire. 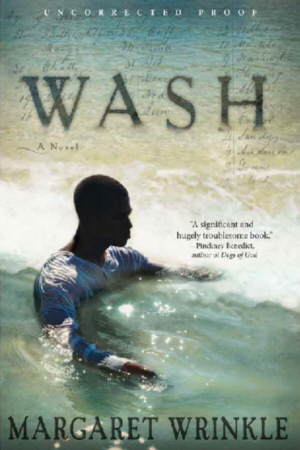 Wash, the first member of his family born into slavery, struggles to hold on to his only solace: the spirituality and faith inherited from his shamanic mother. As he navigates the treacherous currents of his position, despair and disease lead him to a potent healer named Pallas. Their tender love unfolds against this turbulent backdrop while she inspires him to forge a new understanding of his heritage and his place in it. Once Wash and Richardson find themselves at a crossroads, all three lives are pushed to the brink. Written as an accusation, a revelation, and a prayer, this boundary-crossing novel carries the reader from the heart of whiteness into the center of ancestral African spirituality and back again until these two contrasting ways of seeing shimmer together. Questioning all differences of blood and belief, erasing even the line between the living and the dead, Wash sheds new light on our contemporary racial dilemmas.